One of the Caribbean's best-kept secrets, St. Lucia's coastline is nothing short of amazing with its secluded coves and unspoiled beaches. The two sugarloaf-shaped volcanic cones, known as the Pitons, are a UNESCO World Heritage Site and the island's most impressive landmarks. Complementing its shores are miles of lush rainforest, sparkling waterfalls and the world’s only “drive-through” volcano, providing a landscape of stunning vistas. While St. Lucia's official language is English, an early French influence can be seen in place names, cuisine and architecture. The charming town of Soufrière features many lovely French-style buildings that are reminders of a bygone era. St. Lucia offers a multitude of activities for adventure seekers, including ziplining, horseback riding, ATV rides, jungle biking, and more. The underwater caves and coral reefs are a magnet for snorkeling and scuba diving. Nature lovers can sail the island's crystal-clear waters to spot dolphins and whales. A secluded cove. Tropical gardens. A palm-fringed beach. 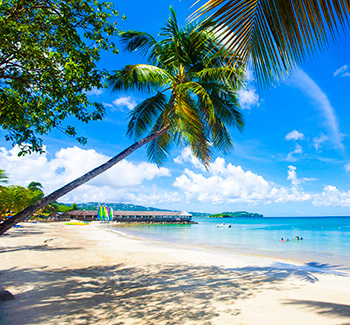 The All-Inclusive St. James's Club Morgan Bay in St. Lucia offers an authentic Caribbean experience that's perfect for families, couples and weddings. Enjoy a refreshingly casual environment offering a wealth of activities, water sports, restaurants, bars and amenities. It's the ideal setting for pampering indulgences, adventure and finding that "wow" moment. © 2016 Elite Island Resorts, All Rights Reserved.